Walton has dipped its toes in almost every corner of the consumer electronics market but with today’s announcement, they have secured their position as a pioneer of technology in Bangladesh. 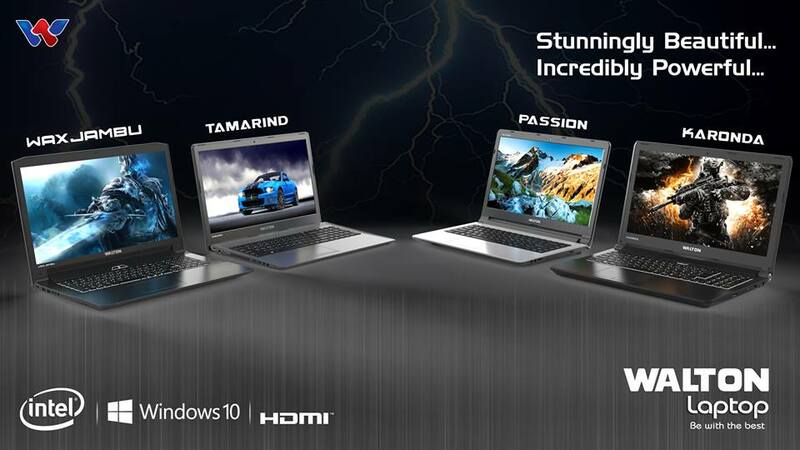 The company revealed four laptop lines via a Facebook post earlier today and the excitement over them is growing. The four lines are dubbed “Passion”, “Tamarind”, “Karonda” and “Waxjambu”. The first two lines appear to have numerous models under their names with similar specifications and design targeted towards the audience seeking a sleek portable experience. On the other hand, Walton is pushing the Karonda and oddly named Waxjambu as gaming laptops with high end 6th gen Intel Core i7 CPUs and Nvidia GTX 960M GPUs. Let’s talk about the Passion and Tamarind lines first. These lines seem to be the entry level offerings. All the laptops under these lines feature HD displays and metallic finishes. They are lighter and more portable compared to the Karonda and Waxjambu. They feature 500GB HDDs, 4GB DDR3 RAM, 6th Gen Core i3-6100U processors and ample I/O. The more high end Karonda and Waxjambu models do away with the metallic designs and opt for a sturdier rubber finish. They have 1TB HDDs, 8GB DDR4 RAM, Nvidia GTX 960M graphics with 2GB VRAM and 6th Gen Core i7-6700HQ processors. These models feature better I/O as all ports are USB 3.0 and there is even a USB Type C port. An added advantage of these models is the backlit keyboards which will enable comfortable use in the dark. The Passion and Tamarind lines do not have backlit keyboards but all the laptops Walton is offering have Bangla font along with English on them. The laptops come with free DOS with genuine Windows on request and support Linux. Specifications wise, all these laptops look promising for the local market but the real question remains in the price. If Walton does a good enough job with the build and provides a good warranty program with the smartphones, they should be able to compete with other companies selling laptops through price. A recent comment on Walton’s own post hinted at a price range between Tk/-29,500 and Tk/-95,500. For now, we have to wait on Walton’s official words but be sure to check back here often because we will definitely get our hands on some of these products for review!